bound in full genuine leather. 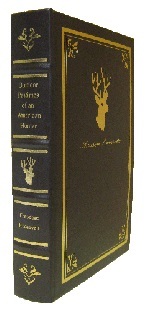 This beautiful and invaluable collection presents exact facsimiles of original editions of TR’s writings (and personal experiences) on hunting, outdoor adventure, and the conservation of our lands and animals. From Roosevelt’s classic, timeless account of hunting in the Dakota badlands...Hunting Trips of a Ranchman to his endearing stories of Forgotten Tales and Vanished Trails, you’ll be with our 26th President as he eloquently takes you along on his exciting journeys of hunting and outdoor adventure! This exquisite library can be yours for the incredible price of $249.95—for the complete set of 12 volumes! You’ll not find this offer anywhere, at any price. 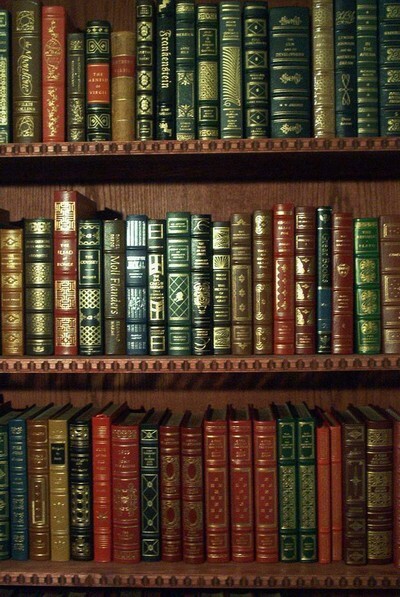 Elegantly bound, these volumes with last for generations to come. Note: This series was reduced to six volumes and some titles are now discontinued! The Palladium Press published an additional Theodore Roosevelt Winning of the West, 4-Volume Set. 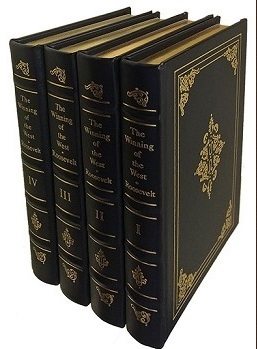 This monumental four-volume narrative is Theodore Roosevelt's ambitious and compendious examination of the nation's westward expansion from it's trans-Appalachian frontier to the Pacific Ocean, from the beginnings of the French and Indian Wars through the end of the nineteenth century.